Five months. That’s how long it takes Country Garden Holdings Co. to start selling apartments after acquiring land. A spate of fatal accidents forced the Chinese builder to slow things down a notch last year, but the pace of construction may pick up again when robots start plastering the walls. The pressure to finish comes from the markets: Of the $14.6 billion the builder has to pay creditors between now and 2021, as much as 86 percent is return of principal. It has to give back that money (plus interest) and borrow afresh. Keeping up this live-wire act is how Country Garden acquired the scale to tackle 2,200 projects in 2018, a 13-fold jump in five years. Compare this with the somnolent life of India’s developers. A six-year loan while they build at leisure? No problem. Don’t want to repay principal for the first four years? Even better. Maybe a six-month moratorium on interest as well? Shadow lenders can’t stop lining up at their doors. After all, the financiers earn a fee for every concession they make, and that juices up their returns. Until there’s no juice left to go around. The funding squeeze faced by Indian nonbank finance companies after the collapse of IL&FS Group in September has seen embattled firms such as Dewan Housing Finance Corp. sell down some of their builder loans, offering a glimpse of the generous terms they’ve been offering. Take India RE Opportunities Trust, assembled recently by Dewan to package and securitize two loans. The borrowers belong to the Wadia Group, which built the ship on which the American national anthem was composed. India’s oldest conglomerate is redeveloping its former mill land in Mumbai into residential towers. The two Dewan loans are for 72 months, including a principal moratorium of 48 months. Investors in the trust’s pass-through certificates will start receiving principal only in December 2021. The time for masking such equity-type investments as loans has passed. 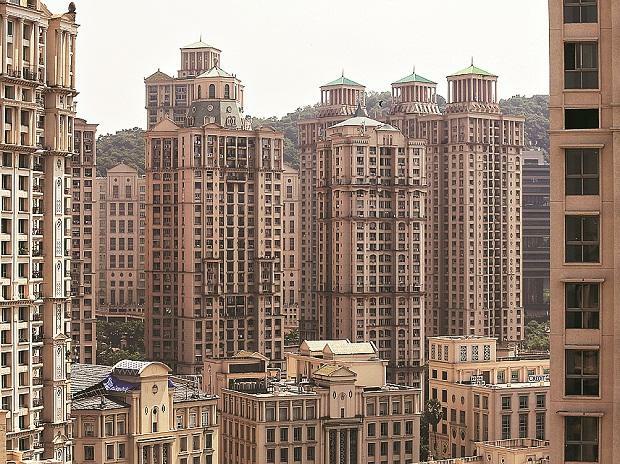 Real estate in India is facing a glut, with $110 billion worth of unsold homes across the top eight markets, including Mumbai. That’s almost four years of sales, according to property analytics firm Liases Foras. Back in 2009, when apartment inventory was equal to about one year of sales, only 25 percent of construction funding came from shadow financiers. Banks controlled 75 percent. The tables have now turned: Housing-finance firms and other nonbank lenders, more adventurous than conventional banks, account for 55 percent of advances to builders. Lenders pocketing 2 percent to 3 percent of the loan value as upfront fees in exchange for not collecting on the principal for years has allowed a buildup of poor-quality debt. Moratoriums have delayed builder bankruptcies, and prevented timely detection of the problem. Now that the underlying demand-supply situation has turned extremely slippery, the question is whether developers will feel enough pressure from struggling financiers to cut apartment prices and clear inventory, or if they’ll be bailed out. The absence of market discipline has kept Indian real-estate prices far too high for far too long. Indian shadow banking has gone from being a growth multiplier to a dampener. The regulator for housing-finance firms has allowed an accumulation of illiquid long-term assets with liquid short-term liabilities. Don’t be surprised if a lack of project cash flows, combined with costlier refinancing, forces some of those property assets to head straight to the morgue when they come out of moratorium. Meanwhile, the stock-market regulator hasn’t exercised enough oversight on mutual funds that invest in securities for which there’s no market: DHFL Pramerica Ultra Short-Term Fund had more than 34 percent of its net assets in a zero-coupon bond issued by its parent Dewan Housing at the end of last month. And this is a fund that claims to have a “moderately low” degree of risk. Predicting the bursting of China’s credit bubble is a global cottage industry. But the risks of disorderly deleveraging in India should no longer be ignored.